The USCC was an organization that furnished supplies, medical services, and religious literature to Union troops during the American Civil War. It combined religious support with social services and recreational activities. It supplied Protestant chaplains and social workers and collaborated with the U.S. Sanitary Commission in providing medical services. The Christian Commission was created in response to what the troops suffered in the First Battle of Bull Run. On November 14, 1861, the National Committee of the Young Men’s Christian Association (YMCA) called a convention which met in New York City. Leaders outlined the work needed to support the soldiers. The design for the “United States Christian Commission” organization was completed the next day. Elaine Hogan began reenacting about 1998 shortly after her husband, Jim, joined an artillery group in their area. The group was a family group and the women of the group began exploring their areas of Civil War interest to present to the public. In her reading about life during that period, she found mention in several books of the United States Christian Commission. As a follower of Jesus Christ, she wanted something that would reflect her faith and began researching to see what she could find on the USCC. She began gathering and reading information including several books, tracts, and other articles used by the Christian Commission. 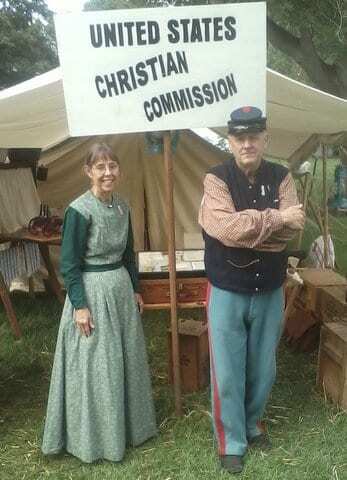 With the help of her husband, they put together a display of sketches and items used by the Christian Commission that could be used to inform the public about the Christian Commission at their events. Elaine and Jim live near Toledo, Ohio, in a renovated one-room school house with their cat, Punkin. Besides attending Civil War events, Elaine received her private pilot’s certificate in September 2014 and is pursuing an instrument rating. She and Jim fly as much as they can. She is also a member of the Civil Air Patrol. Elaine and Jim enjoy spending time with their grandsons and at their cottage at Beulah Beach, Vermilion, Ohio.